Whether it’s in business, your job, a relationship, or really any aspect of your life, something I’ve seen a lot is this idea that we’ve done something wrong when we don’t get the result we hoped for. The usual feelings of frustration and despair start bubbling up and you guys already know that’s not an ideal place to be. What if I told you that you are never doing anything wrong? I know, it seems impossible, but what I want to explore on today’s episode is how you can take continuous inspired action even when you’re doubting every step you’re taking. Join me this week as I dive into how you can take inspired action and always move forward from a place of love. Fear is only going to halt the momentum you’re trying to build, and I’m going to help you create the vibe that’s going to bring you the success you dream of. What doubting yourself does for your business. The difference between taking action from a place of love versus fear. One question to ask that will help you take continued inspired action. Hello, how are you all? Happy Wednesday. Happy hump day. I hope you are having a lovely day. I am pumped to be here as always. If you guys don’t know, if you’re new to the podcast, I record my episodes in my closet. I’m looking at my clothes right now. It’s a very interesting sight. I’m very excited for the day Chris and I move and we have a podcasting studio. I’m putting that out there in the universe. I already know it’s happening and it’s on its way to me and I will remember these days fondly when I sat and looked at my sweaters and recorded these episodes for you guys. 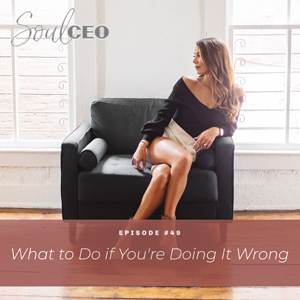 And when we think we’re doing something wrong, like when our thought is, “I must be doing something wrong,” I don’t mean morally wrong, I just mean wrong in general, then it creates our reality that we’re doing something wrong. And this sounds kind of crazy. You guys always know I’m going to kind of bend your mind, but what I realize is what if it’s never that you’re doing something wrong and that the result is already on its way to you and you get to just keep taking inspired action? And I promise I’m going to explain this more. But I find this happens so much with my clients who are trying to grow their businesses. They’re trying all these different things and they keep having this feeling that they’re doing something wrong because they’re not yet getting the clients or they’re not exploding the way that they expect yet. And what that does is it causes them to question themselves constantly. Am I doing this wrong? Do I need to post differently? Is my photo bad? Is this bad? And then that creates your results or lack thereof. But what if yes, there’s room to grow always, learn and grow and take feedback and change and adjust because the definition of insanity is doing the same thing over and over again and expecting different results. So by all means, change things, but what if instead of changing things because you feel like you’re doing something wrong or it’s bad and you’re not getting the result and you’re frustrated, you decided to change things from a place of I’m doing it right or I’m figuring it out and I’m going to keep taking inspired action. So if the thing I’m doing isn’t quite getting me the result that I want, I get to try another inspired action. It’s kind of the difference of coming from love versus fear. It’s coming from this place of I’m doing something wrong versus I’m doing it right and the result’s on its way. What other actions do I want to take? Because what I find typically is that we get frustrated and we’re not giving momentum the opportunity to build and it’s building in the moment. Like, the things you’re doing today you might see the result of in six months. But if you keep feeling like you’re doing something wrong and you’re frustrated because you’re not getting the result, you’re going to keep changing it, when really you might be building the momentum, it might be happening, it might already be coming. So what if instead of feeling like you’re doing something wrong, you just challenge yourself to keep taking inspired action and to learn things and say okay, what could I do differently? That is a much different place to make a change and it’s something that’s very hard. Some of my clients I’ve had to coach very hard on this because they’re convinced they’re doing something wrong and they want to look for answers outside of themselves or elsewhere. And by all means, I think it’s so important to keep growing and learning. There’s a difference between going and getting something when you feel like you’ve done it wrong and you’re bad or you’re doing it wrong and you need answers, versus trusting that you’re following this path and you want to keep taking inspired action and you want to learn from there. That’s why for me, as a coach, I never want someone to hire me because they think I’m just going to hand them over all the answers. Like yes, I’m going to tell you what’s worked, I’m going to coach you on it, I’m going to give you examples, I’m going to guide you and bring into your awareness of what’s possible and the way I do things and teach you how I think and help you access this inspiration and creativity within yourself, but I never want someone to hire me from a place of I’m doing everything wrong. Now, some of you guys might have hired me from that place and I probably worked on that right off the bat. I just snapped, I don’t know if you can hear that because I’m intense and I’m Italian and I move my hands a lot. But I want you to come to me, to hire me, to work with me from a place of I’m inspired, I want to do this work, I want to keep growing. Not from a place of I’m doing things wrong and bad and I need help, somebody fix me. You do not need to be fixed. You are not broken. You’ve not done things wrong. You’re just learning and growing and you’re building the momentum. So I want you guys to ask yourself, if you knew the result was already on its way to you and you couldn’t do anything wrong, you are just learning, you are on this journey, what new inspired action would you take? How would you adjust what you’re already doing? And that’s how you can learn and grow and change the things you’re doing to create different results. So I hope that helps for those of you who are stuck in that place or if you come upon that and you realize, my brain is telling me I’m doing something wrong, that’s not it. And look at it from a place of you’re on this journey, you’re figuring it out, you’re working towards it, and you are not broken. You do not need to be fixed, and you’re not doing something wrong. You don’t need someone to tell you what to do that’s right. You have access to that and the best place that you can create is from that inspired action, from that place of trusting the result is on its way. And you have the answers inside of you, and what you feel in your heart that you want to do and you want to do for your audience, network, the people around you is guiding you. So I love you guys, I hope you have a beautiful day and I will talk to you next week. Bye.